Watch this man cuddle and give back-rubs to a orphaned Kodiak Bear! 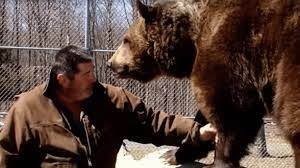 Jimbo has been living with Jim the American bear trainer at The Orphaned Wildlife Center in New York for over 20 years. The two have a very unlikely bond and love to play around together! The bear is a Kodiak bear, found in Alaska. Jimbo especially loves getting back rubs! Sounds too good to believe? Just check out this video below!